A dawn unlike any other. It will mark my existence forever. This little fellow in the arms of his mother will illuminate our life. I look at him and look at him. And as I look at him I feel the presence of others also seeking to protect him. 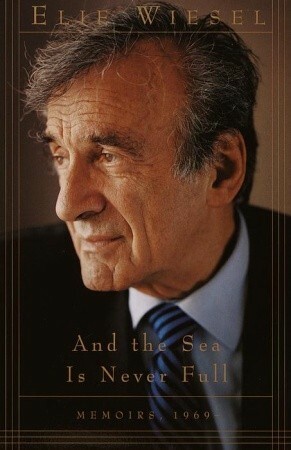 And The Sea Is Never Full, is the continuation of Elie Wiesel’s memoirs. Written in the middle of his life, this work begins with two life-changing and joyful events – his marriage in Jerusalem to Marion Rose (1969) and the birth of his son, Elisha (1972). I have a wife I love, and yet I write not about love but about solitude. I have a home filled with warmth, and yet I write about the misery of the condemned. Driven by memories of the Holocaust, Elie’s memoirs are a cornucopia of the thoughts, observations, and struggles of a man firmly rooted in his faith but struggling with both G-d and man. In And The Sea Is Never Full, Elie shares that he feels obligated to “turn my attention to those who have been judging me.” Shadowed in all he relates is the responsibility to bear witness. As always there is an intensity in Elie’s words that make this a worthwhile but, at the same time, a heavy and challenging read. In this conversational narrative we enter a labyrinth and meet world leaders, rabbinic scholars, travel the world, dip into the political arena, and engage in pressing issues of the day. Woven throughout Elie’s personal experiences are Hasidic legends and stories. Prevalent throughout the book is a heaviness that Elie is seeking answers to unanswerable questions. A writer cannot detach himself from his story. He is responsible for it to the end. As a champion for human rights Elie speaks forthrightly and, honest to his understanding about persecution, racism, refugees, always, always, always for those he perceives to be the underdog. And, throughout the narrative, Elie remains deeply involved with, and concerned about, Israel. Deeply honest, this personal spiritual journey of Elie’s is one we wish we could wholeheartedly recommend but in truth cannot. 80% wonderful, 20% left oriented, we cannot, without reservation, recommend a read in which we consider that an unbalanced view of the Israeli – Arab conflict is expressed. (A view that we believe Elie balanced out later in his life). This book, however, does stand in contrast to those critics who have said Elie Weisel had the tendency to whitewash all Jewish behavior and blindly support Israel. As I write these words, I contemplate the photograph of my home; it is always before me, heavy and sealed under the weight of darkness. And yet I want to go back to Sighet one last time. To write the last pages. I am not afraid of losing my way. Like Elhanan in ‘The Forgotten,’ I am afraid of forgetting. I read, I reread what I have written, what others have written. And God in all that? I stumble on three poignant words in Book of Lamentations – the prophet says to the Lord, “Haragta lo khamalta – You killed, You had no pity.” Earlier the prophet said to the Lord, “In Your anger, You hid and persecuted us.” Why, God? Why? I am afraid to know the answers. I am afraid not to. But above all, I tremble at the idea that my memory could become empty, that I could forget the reasons that have allowed me to set one word after the other. I am afraid to know the end before I begin. What shall I begin Father? I feel like singing, singing of happiness and serenity. I want to love, to laugh, to accompany the lonely on their road to nowhere. I want to pursue the work G-d started in the heart of man. How am I to sing, Mother, how am I to sing the songs that your father, Grandfather Dodye, taught us on Rosh Hashanah eve? How can one still love in this life, when you, Tsipouka, my gentle sister whose future was stolen by the enemy, when you entered death so small, so frail, so innocent? I still have so many questions to ask you, Father. So many doors to open, so many secrets to discover. Will I have the time? Wow! The depth of thought…wrestling with records playing over and over in his mind. The anguish remained on his face from past experiences, yet he was still willing to make his requests to G-d, instead of turning his back. If only he could have understood that the Father will redeem what the enemy has stolen and “time” has no authority. I hope I meet him someday!